Bhutan blessed with many natural wonders and age-old Buddhist culture with unique geographical setting offers wide ranges of special interest tours which is rare in other corners of the world. Your interests are our responsibility and fulfilling your wishes is our main purpose. Listed below is a selection of our special interest tours. For detailed itineraries we can customize an itinerary to suit your requirements as per your convenience. Just contact Bhutan Glacier Tours and we will design a suitable itinerary for you. Bhutan is a paradise for bird lovers and ornithologists. Over 670 species of birds have been recorded and many more are yet to be discovered. Around 50 species of the known birds are winter migrants. These include ducks, waders, birds of prey, thrushes, finches and buntings. The partial migrants to Bhutan include cuckoos, swifts, bee-eaters, warblers and flycatchers. The country harbors more than 16 species of vulnerable birds. They are the Pallas’s Fish Eagle, White bellied Heron, Satyr Tragopan, Grey bellied Tragopan, Ward’s Trogaon, Blyth’s King Fisher, Rumped Honey Guide, Purple Cochoa, Rufous Throated Wren Babbler, Red headed Parrot Bill, Chestnut breasted Partridge, Blyth’s Trogon, Wood Snipe, Dark Rumped Swift, Rufous necked Hornbill, Grey crowned Prinia and the Beautiful Nuthatch all of which breed in Bhutan. As the stronghold of Vajrayana Buddhism, meditation and retreats is a common feature especially amongst the Buddhist practitioners and the monks. One can come across small retreat centers and hermitages all over the country next to temples, monasteries and monastic schools. These retreat and meditation centers provide the Bhutanese with the much needed respite from the humdrums of normal life style and it is a common trait amongst the Buddhists to disappear into the mountains for days, weeks and months. The retreats provide people and the practitioners to draw upon their inner self and visualize upon the purpose of life. Many tourists from Thailand and other Buddhist countries come to Bhutan for meditation and retreat tours. Some itinerary includes serious meditation for days while some are solitary retreat for few hours in the high hills and temples where nature surrounds and silence is unbroken. We also have hotels that provide yoga sessions, retreats and meditation facilities within the hotel premise. We offer exciting rafting and kayaking tours in the clean and clear rivers of Bhutan. The crystal clear rivers of Bhutan are one of the Kingdom’s best assets. The melting glacial over the Eastern Himalayas accumulates downstream forming six major rivers (Wang Chhu in Thimphu, Puna Tsang Chhu in Punakha, Mangde Chhu in Trongsa, Kuri Chhu in Mongar and Dangme Chhu in Trashigang and their tributaries), have been scouted for kayaking and rafting. They cut through high valleys and low plains to meet up with the Brahmaputra River in India. The natural setting and the sheer variety of the rivers’ courses makes up for a unique opportunity to explore Bhutan’s beautiful wilderness. It is more than a teaser and an invitation to anyone interested in adventure travels. The rivers are plentiful with high currents and depths reaching a maximum of about five meters; at places it passes gently on and in others the rivers rage through loudly, dominating the environs. Although adventure sports and tourism are relatively recent introductions, it is gaining on in popularity. The Pho Chu in Punakha Valley, with its approx 16 km course with about 15 rapids of class 2-4 is the most popular for rafting in Bhutan followed by Mo Chu river in Punakha Valley with 10 Km course comprising around 10 rapids with 2 - 2+ rapids. Well trained rafting and kayaking professionals will ensure and do everything to make our guest enjoy the adventure while minimizing the risks. The rivers of Bhutan were first surveyed for potential routes for water sports in 1997 by Gerry Mofatt and Peter Knowles, both experienced rafters/kayakers at the invitation of the Royal Government and the Department of Tourism. Uniqueness in culture, the geographical placement of our ancient monasteries and fords overlooking most of the valleys and breadth-taking stunning landscapes overlooked by clear blue sky of Bhutan cannot hold back any photographers’ curiosity in taking out their camera as soon as they step out at airport. Photographers certainly have curiosity to explore the world in fresh ways. The beautiful snowcapped Himalayas, mountain passes, river valleys, varied vegetation on the hillsides and in the valleys, abundant flora & fauna, historical & cultural sites, among the most colorful & lively festivals in Bhutan are the prominent attractions to capture. While travelling, itinerary provides adequate time to interact with the people, learn about their life-style, traditions and shoot the images of exquisite temples, Dzongs (Fortress), farming villages, towering Himalaya. We customize your photographic tour according to your preferences and we guide throughout to get your best shots. Best Seasons for Photography: March, April, May, September, October & November. Meeting interesting Bhutanese local people and taking short hikes through fields of seasonal crops hand picking local available fresh fruits, tasting particular family’s special local dishes, clicking pictures, joining the family for meals will give you wonderful experiences. Homestay / Farmhouse tour will be organized across 5 beautiful valleys of Paro, Thimphu, Punakha, Wangdiphodrang (Phobjikha) and Bumthang. You will get to experience nights both at hotels in city and at traditional Bhutanese farmhouse experiencing typical Bhutanese family life. It can be another experience to put up your night at HOMESTAYS & FARMHOUSE but hotel like facilities should not be expected. You will be put up in a village house and experience rural livelihood. Enjoy the unique opportunity to live with a local family, while you get to experience the culture and lifestyle of the host family. It can be another experience but hotel like facilities should not be expected. You will be put up in a village house and experience rural livelihood. Enjoy the unique opportunity to live with a local family, while you get to experience the culture and lifestyle of the host family. Possibly you’ll help milking cows, help in the kitchen make cheese and butter, and feed cattle’s as well. Explore the neighborhood. Food is simple and prepared in traditional style and served traditionally. You will be forever touched by this glimpse of the ancestral way of life. 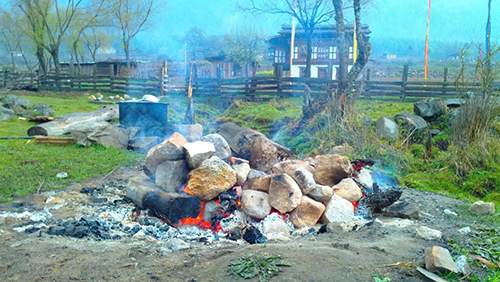 A traditional Bhutanese hot-stone bath facility is available at the most of the home stays for visitors which are common in rural Bhutanese homes. 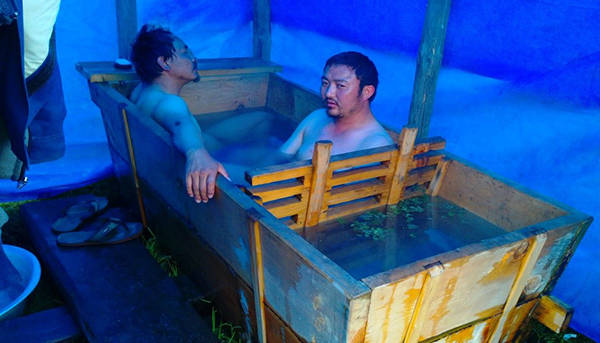 This service entails bathing in traditional wooden tub with hot water heated from stones. The hot stone bath is considered to have soothing medical properties.